Our bespoke brides are all unique and so are their carefully made custom gowns and accessories. Dajana was introduced to me through a mutual work colleague and I’m so pleased we were put in touch. I’d seen a veil I liked but unfortunately it was a bit out of my budget. I showed Dajana the design and within a week she’d already come back to me with beautiful sketches. After a couple more lovely meet-ups over coffee I could see Dajana really understood what I wanted and she showed me the elegant fabric swatches she’d sourced. The veil I’d originally seen had an intricate pattern with beautiful beaded embroidery and was not easy to replicate but Dajana and her team did a fantastic job! The result was even better then I’d hoped for and I had so many comments from guests remarking how exquisite my veil was. After finding my dream wedding dress, I started to look for a veil but I couldn’t find anything that was 100% what I wanted. That was when I appoached Dajana and asked if we could come up with a veil design which would go with my dress and correspond with something I had in mind. She really paid attention to what was important to me and thanks to her talent and creative mind, she managed to really create my dream veil. The softest silk tulle, intricate floral details with lots of attention to detail and a veil that went perfectly with my wedding dress was the result. I couldn’t be happier. 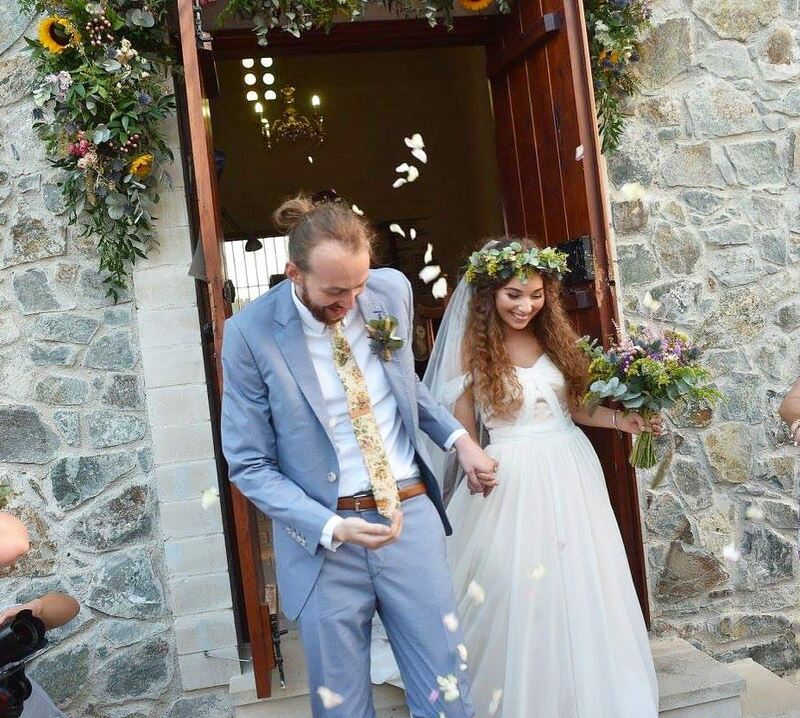 I’m lucky enough to have known Dajana since her law degree and therefore remember when she first announced her decision to pursue a career in bridal gowns full time. Her passion, determination and hard work are a testament to how successful she has become in such a short period of time. There was no question about who would be designing my bridal gown once my husband proposed. Having said that, I’ve seen Dajana interact with other brides and she treats each and every one of them as a close friend. I didn’t have a ‘set’ image of my dress in mind once we started the process, but the final result could not have been more in sync with my personality and my body type. Dajana has been very patient throughout the process and her vast knowledge on materials made it very easy for myself to start picturing my ideal dress. 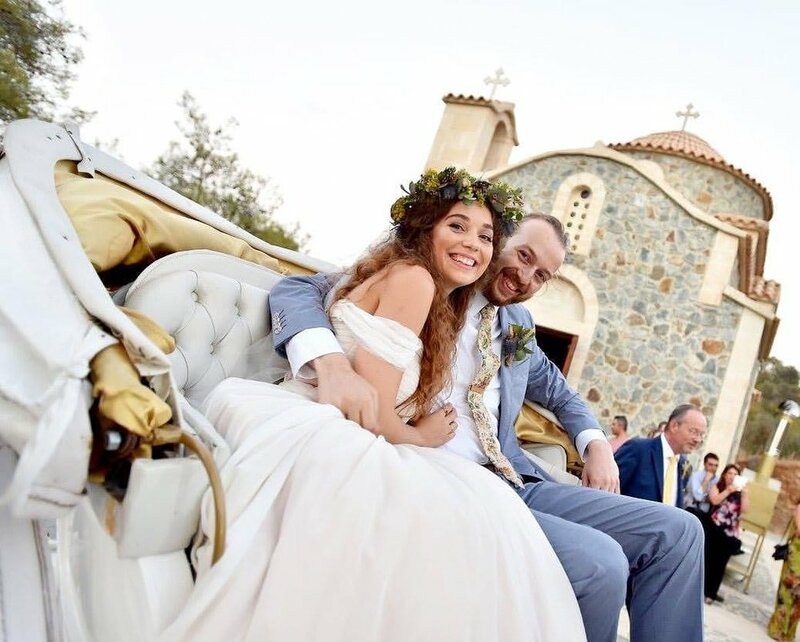 She produced different options as sketches and her incredible attention to detail in lace patterns, including suggestions for appropriate under layer to accompany hot Cypriot weather, made the dress feel like a second skin on my big day. It was comfortable, undeniably feminine and unmistakably unique. I had been looking for my wedding dress for quite some time and was frustrated because I thought what I had in my mind was simple, but nothing in the shops seemed to be what I was looking for. Thankfully Dajana was reccomended to me and from the first time we met for a coffee to discuss my ideas, I realised that Dajana was really listening to me and truly understanding the vision I had in mind. Her sketches are beautiful, and we quickly arrived at my final dress sketch by combining parts from various of her initial sketches. I love the way Dajana was so enthusiastic about my special day. She achieved my vision of a soft, floaty, boho dress. I didn’t want a pure white dress that would make me look washed out. She helped me choose the right material with hints of subtle rose pink that complemented my skin tone. Dajana paid close attention to detail and was very good at choosing the right materials to stick within my budget as well. Could not have been happier with Dajana @ Dajana Basic London. The thought of designing my own bespoke bridal gown really appealed to me, especially the idea of adding a little colour instead of the usual ivory or white. I had countless compliments on the day of how much everyone liked the dress. I am just so happy that I made this decision as it made the whole experience of getting married, the run-up to the wedding and the day, extra special for me. I cannot recommend Dajana Basic enough. Thank you so much for your patience, tenacity, commitment and care in creating my bespoke wedding gown. I was thrilled with it long before it was finished - I was over the moon as I stepped into it on the day. You were so helpful, professional and relaxed. Not only were you easy to work with, you took all the stress away and made the process of getting the perfect look fun. The finished product was a dress that turned heads and we created many happy memories whilst making it. A dress designed and made especially for you means so much more than one purchased from a rail. It makes any girl feel unique and it is simply awesome to be a part of the making process, saying comments like: “I want it to be like the sea breeze in a Greek island on a sweet September afternoon” and getting what you asked for! I would recommend you time and time again. There were lots of incredible special moments and things of the day but being happy, safe and feeling a million dollars in my dress made it all the more perfect. I am the first.... yes, and I am very proud of it. To be the first bespoke bride who wears a Dajana Basic London dress. Like every woman, I always dreamed about how I would like my wedding to be. I knew I wanted a very special, bespoke gown, perfectly and uniquely tailored for me. Dajana and her team created this dress for me with loving care and attention to detail. Starting from the first sketch up to the first fitting in London and the Dressing on my big day, I experienced Dajana’s professional attention to styling and detail.